Samsung has finally released their new series of slim LCD monitors that go just 1.18 inches (30 mm) in depth on the the P2070 (20″) and P2370 (23″) models. The P2370HD model is just 2.58 inches (65.5mm) deep. The 70 series LCDs boast 50,000:1 contrast ratio and Samung’s Touch of Color (ToC) design. Both of the P2370 models have 1080p (1920×1080) resolution although the P2070 runs just short at 1600×900. The P2370HD comes with many more options you’ll want to consider such as an HDTV tuner, integrated speakers with SRS TruSurround HD and HDMI and component inputs. The 70 series (P2070/P2370) also feature 2ms (GTG) video response time which minimizes blurring in high-action sports and gameplay. (The P2370HD has a bit slower response time, although perfect for gaming, at 5ms.) A bevel frame design in the Touch of Color series is said to reduce reflection and glare. 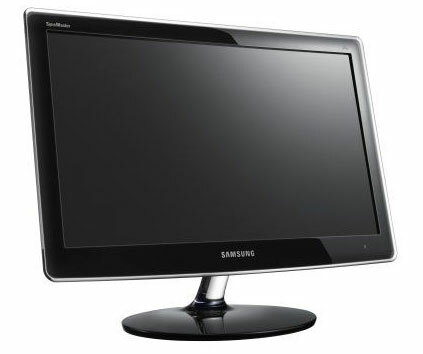 The monitors also feature Samsung’s Startlight Touch Controls.